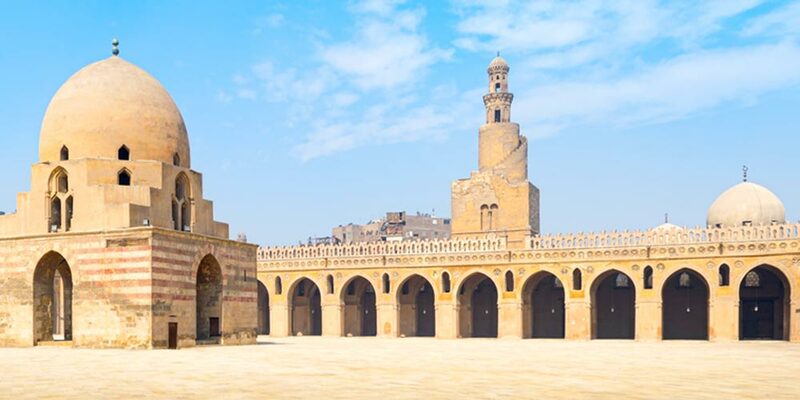 The Mosque of Ibn Tulun is considered to be the oldest Egyptian mosques that have survived with its original shape and it is also the largest one in Cairo. It was built between AD 876 and 879 by Ahmed Ibn Tulun, who was a soldier among the troops of Samarra and was promoted to rule Egypt between 868 and 883AD. The Mosque is well known with its terrific architecture and unique Minaret. It is a rare example where Europeans admitted its influence on the development of many features of their architecture and that is why it is known all around the world with its exceptional background. The main elements inside including the pointed arch, the pier, and wall battlements formed the essential ingredients of the birth of Gothic architecture. This architecture led Europe to the Renaissance. He was the founder of the Tulunid dynasty that ruled Egypt & Syria between 868 and 905. He was sent to Egypt as governor by the Abbasid caliph in 868. He became a virtually independent ruler by evicting the caliph fiscal agent, Ibn al-Mudabbir. Ahmed Ibn Tulun established a large military force and his main target was to establish an efficient administration in Egypt. He built a new capital, al-Qata’i, which is located north of the old capital of Egypt “Fustat”. What is truly fanciful about him is that he was the first ruler since the Ptolemaic Pharaohs to make Egypt an independent political power again. He was the son of a Turkish slave owned by the Abbasid Caliph al-Ma’mun from which he reached his great power in addition to founding the Tulunid Dynasty of Egypt. He set the tone for later Egypt-based Islamic regimes, from the Ikhshidids to the Mamluk Sultanate of Cairo. When Ahmed Ibn Tulun became the ruler of Egypt, he established a new city called Al-Qata’I and to do so, he cleared a Christian & Jewish Cemetry. His mosque was first restored in 1296 by Mamluk Sultan Lajin, who had conspired the assassination of Sultan al-Ashraf Khalil ibn Qalawun. Through the restoration and the rebuilding process, the unique Minaret of his mosque has been rebuilt. In 1999, some renovations have been made including the paving of the courtyard and the re-facing of the fountain in black marble. 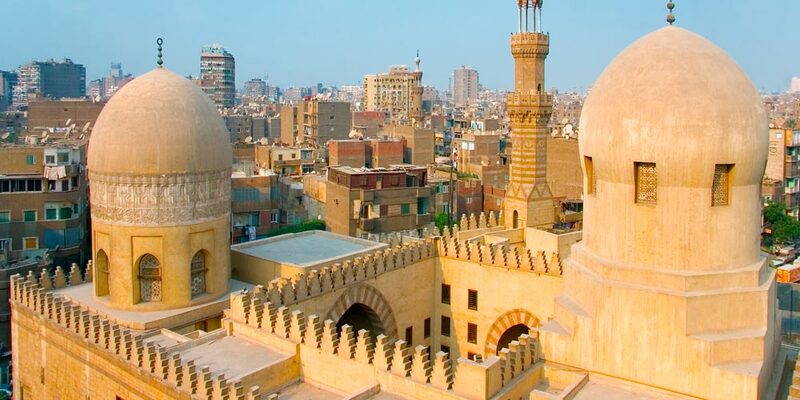 The Great Mosque of Ibn Tulun is the third congregational mosque to be built in greater Cairo. It is at about 26,318 square meters in size and that is why it is considered the third largest mosque all around the world. The mosque was damaged as it was used as a shelter for the North African pilgrims who wanted to go to the Hijaz in the 12th century. Luckily, it was restored and refunded by Alam al-Din Sanjar al-Dawadar at the behest of Mamluk Sultan Lajin in 1296. It is a very important center of tourism because of its features which reflect the Abbasid art particularly concerning the minaret, the great rectangular piers with engaged corner columns and other features by Samarra mosque in present-day Iraq. Around the mosque, there is a huge enclosure, which measures around 118 x 138 meters. There are also narrow enclosed wings “Ziyadas” surrounding the mosque from its three sides. Within the northern Ziyada, there is the famous Minaret. This minaret is connected with the mosque by way of passage. There are about 42 doors that enable you to get into the mosque. The courtyard “Sahn” is a square and it is surrounded by covered porticoes, each consisting of two aisles of pointed arcades raised on strong piers, and overlooking its open center. There are three sections inside the mosque: the praying hall, the Mihrab, and the Minber. Note: If you prefer to visit Mosque of Ibn Tulun beside to the other Islamic landmarks, please check our Cairo day Tours. The fountain, which was in the center of the mosque has never replaced after a fire consumed it in 980. In 1077, one of the gates has been restored by al-Mustansir Bellah. Four plaster mihrabs were added to the mosque. The first one of these mihrabs was added in 1094, two belonged to the Fatimid dynasty and a fourth one was erected in the 13th century. In 1296, the mosque has been restored by Sultan Lageen and he tiled its floor. We have always been interested in what is old and valuable from the ancient of Pharaonic, Islamic and Coptic heritage, so we provide Egypt tour packages for those looking for a magical tour to explore and witness the vintage beauty of Egypt.